What is Passport 2 Print? 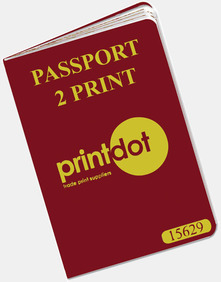 Passport 2 Print gives registered holders many advantages and is designed so that businesses can benefit from exclusive offers that are not available through the Printdot website. Passport 2 Print holders will also benefit from the best discounted prices across the range and priority turnaround times on all orders. Who would benefit from Passport 2 Print? Plus anyone else who orders print regularly! You can apply by entering your contact details on the form above. We will send you a short application form for you to return to us with a Pro-forma invoice. On receipt of your application form and payment we will issue you with your Passport Certificate and unique holder number which will need to be referenced on all enquiries and orders (we will also give you a gift to help you always remember it!). Exclusive offers will be e-mailed monthly and you can start taking advantage of very special prices straightaway. If you have any questions please contact the Printdot Team.